Team UK are “super excited” to have today landed in Hungary ahead EuroSkills 2018. 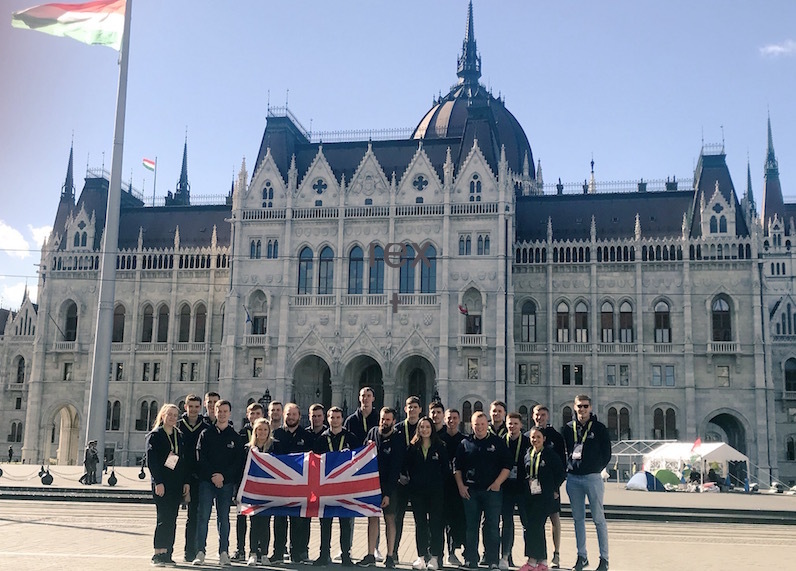 The 22 competitors flew nearly 1,000 miles to Budapest from Luton airport at roughly 9am this morning and spent the rest of the day touring the city centre before heading to the capital’s stunning houses of parliament. FE Week caught up with a couple of Team UK’s competitors a few hours after landing to find out how the camp is feeling. “The team feeling is great, it really makes you want to go for the competition,” said heavy truck maintenance contender Kieran Leyland. Floristry competitor Elizabeth Newcombe said she and her teammates are “super excited” and “can’t wait to get into the competition”. “I’m ready to go for it and give it everything I’ve got,” she added. “[In the build to the competiton] I will be going over my notes, sketches, get everything ready to go and get into the right mindset. The team will look to get in an early night tonight ahead of their familiarisation day tomorrow, where they can scout out the competition floor at the HUNGEXPO Budapest exhibition centre. Later that evening EuroSkills Budapest will host the opening ceremony before competitions start on Wednesday (September 26). The tournament will conclude on Friday with the closing ceremony held the day after where results will be revealed. FE Week is media partner and will be covering the competition every step of the way. Follow us on Twitter @feweek using the hashtags #TeamUK and #euroskillsbudapest2018. Wishing Team UK every success and enjoy the experience- good luck to you all. Wishing you all the best, iall of you are winners and shining examples of what make the UK great. Every good wish to every Team UK competitor at World Skills. Go Team UK. Very proud of you all for being so committed and working hard. Great example for all those who follow in your steps. Congratulations on getting this far, and I wish you success at this stage of the competition, and enjoy as well. Good luck to all of the team, I know you will do us proud. Go for it team UK! Good luck and wishing you all every success…EXCITING! Amazing opportunity. Well done for getting there. Enjoy! Wish you all the very best. Go Team UK!!! Congratulations for getting this far and best of luck team UK. Good luck Team UK #euroskillsbudapest2018 you are already winners. Best wishes Team UK for an enjoyable and successful competition. Well done Team UK. You should each be justifiably proud of your achievements. Wishing you the very best at the competition and what ever the results; You are all winners! Good luck Team UK! Enjoy the EuroSkills and make the most of this international opportunity! Best of luck to all the team….enjoy the experience! Good Luck to all those part of Team UK. Very proud of you! Sending best wishes to our Team UK competitors at World Skills. This is an amazing opportunity to demonstrate how talented you are. Good luck to all the young people representing the UK at the Euroskills competition this week! So proud of these talented students and in particular, our Cardiff and the Vale Electrical Installation competitor ! Best of luck and enjoy the fantastic experience ! 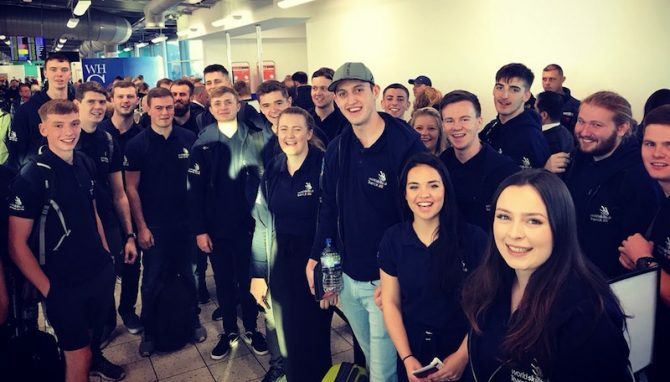 Good luck – Team UK representing us at the World Skills competition. We are very proud of you. Fantastic work Team UK, all the very best of luck for World Skills. You can do it! Good luck to everyone representing the UK at this brilliant event – an opportunity to showcase both the great work and dedication of learners and of their committed and hardworking teachers and trainers! Good Luck Team UK, everyone at Gateway Qualifications wishes you all the best at EuroSkills in Hungary – do the country proud! Hope you have a fantastic time, and look forward to hearing about it in FE Week. Good luck Team UK from all at SCL Education and Training Ltd.
Best of luck from everyone at Adult and Community Learning in St Helens. From the Devon & Cornwall Training Provider Network. Enjoy the competition, we are all supporting you & know you will do us & yourselves proud! Good luck to all Team UK competitors. Hard Work Wins! Be proud of what you have achieved and strive for even greater. Everyone at Milton Keynes College wishes Team UK taking part in the EuroSkills 2018 event the very best of luck for the competition. It’s wonderful to think that British students will be flying the flag not only for the country but for the FE sector. Time to show everyone what college students can do! Good luck to team to Team UK at Euroskills 2018 from everyone at Management Training Plus. We will watch your progress with interest and be supporting you all the way. Best of luck to all Team UK competitors from all of us here at City College Norwich!